Treadlette Tuesday: Julia's Plaid Jacket! Julia whipped up this soft, cozy jacket from cotton plaid flannel, just in time for the chilly weather! She used the Quincy Top pattern from Sewing Workshop and found a bright blue separating zipper online. 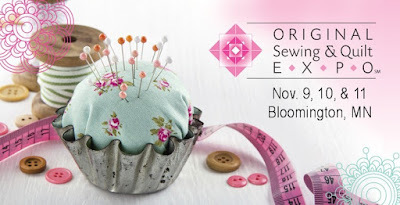 Visit Treadle at the Original Sewing and Quilt Expo, Nov. 9, 10, & 11 at the Doubletree Bloomington! Enjoy 3 days full of classes, shopping, and sewing fun! 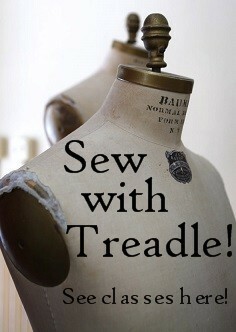 Treadle has a huge booth this year with plenty of new, exclusive fabrics for sale! Come to a special Fashion Sewing Club meeting - happening all three days at the Expo! Wear or bring something you've made for a chance at a fabulous door prize! 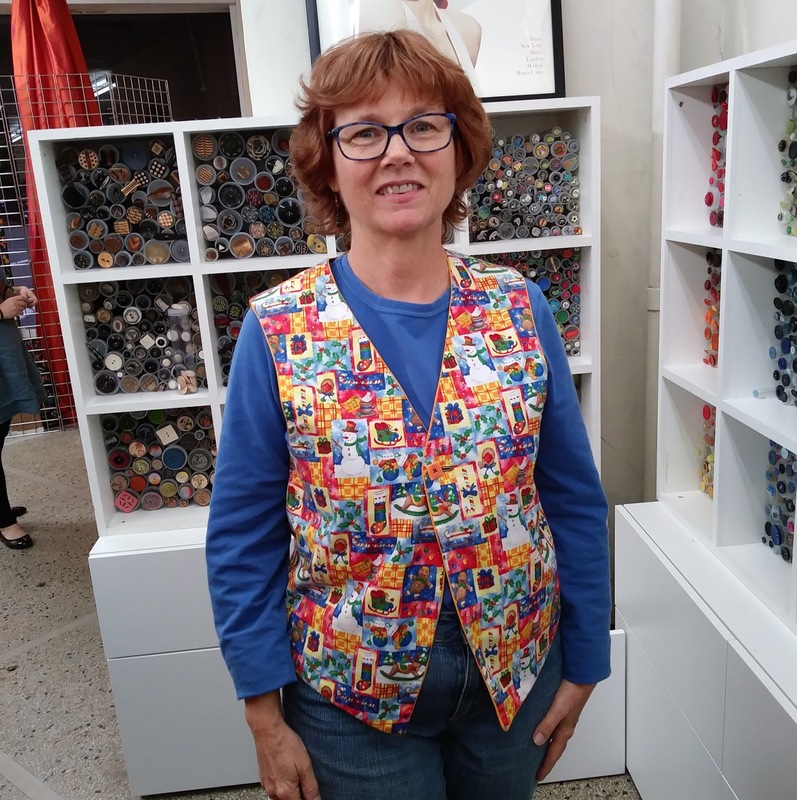 The Material Girls will also be at the Treadle booth during the Expo to answer your questions and help you get inspired. We have plenty of new wool in the store, and today we're looking at these handsome tweeds! Tweeds have great loft, helping them trap warmth wonderfully. They can come in many weaves, such as twill and herringbone, but always with a great texture, large fluffy yarns, and signature colored flecks. A tweed wool is a classic choice that never goes out of style! Perfect for your next jacket! We have some very fine new European imported cotton lawn prints. The colors and drape are stunning! A few gorgeous new cotton knit prints from Art Gallery! 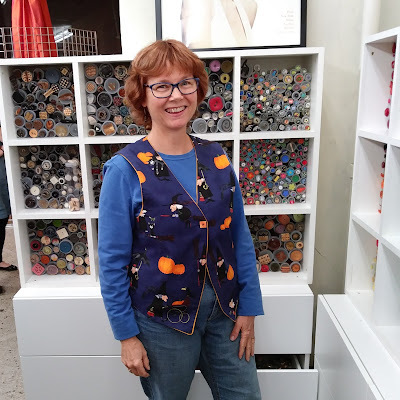 Treadlette Tuesday: Julia's Reversible Vest! Treadlette Julia was spotted at the store wearing this cute Halloween vest the other day! It's fun and seasonal, and really dresses up a t-shirt and jeans, but it gets better! It's reversible! And it reverses to a Christmas print! Of course we had to have her model the Christmas side as well. Julia says that if you're going to wear seasonal prints, you may as well try to get a little more time out of them! 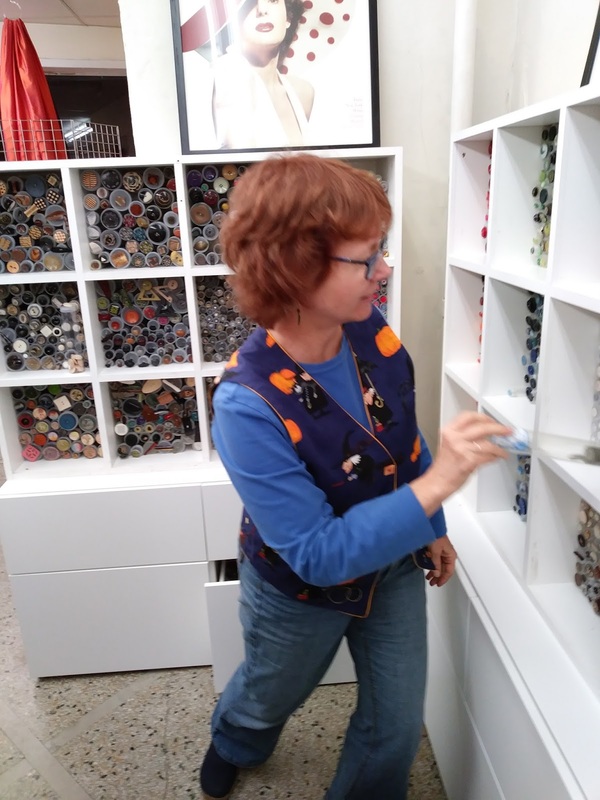 You might also notice that Julia is standing in front of our gorgeous new button corner. Well, Julia is our Goddess of Buttons at Treadle, and she organized this fantastic button re-do! We think it looks great! This polyester sheer organza is perfect for your next Halloween costume or special occasion sewing, and since it's poly, not silk, it's affordable! Get as many yards as you need to be fabulous without breaking the bank! We have a great group of new linen/cotton prints from the Maker Maker line! 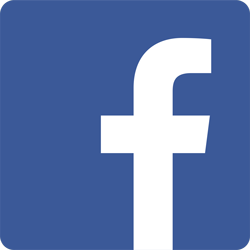 Use it to create fresh modern bags, crafts, and structured garments like pencil skirts and jackets. Fall is for layering, and this tissue-weight rayon jersey makes an ideal top for combining with sweaters or jackets. Available in a range of rich colors and super soft to the touch, you'll want a whole wardrobe of new tops! 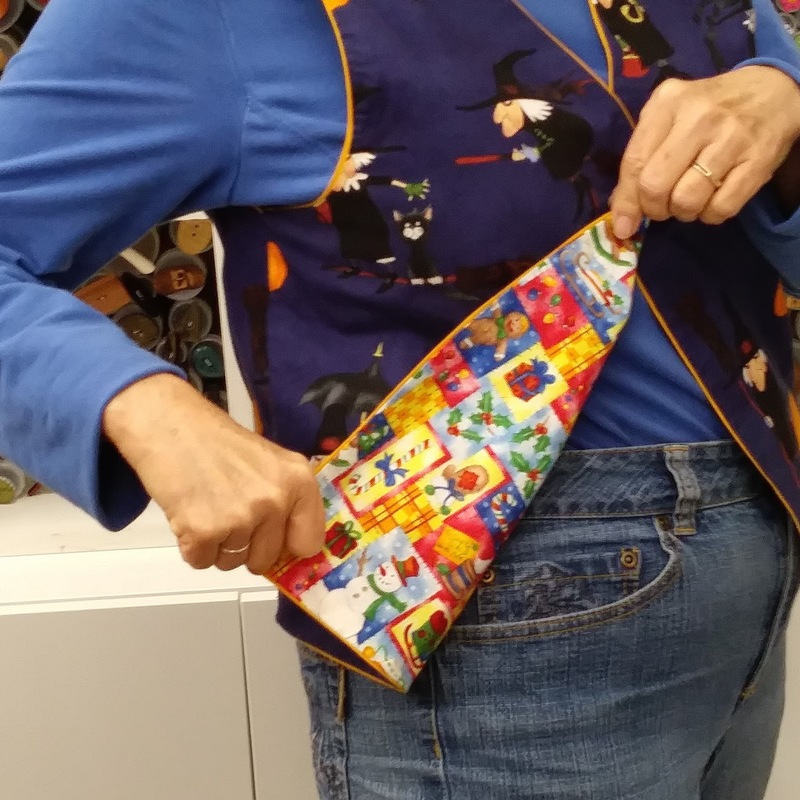 Halloween is right around the corner, and we have plenty of fun, spooky fabrics! Get in the Halloween spirit with simple skirts and aprons! Make table linens for a witchy party! Or whip up some super quick and durable treat bags for trick-or-treating! These skeletons GLOW in the dark! We have some perfectly creepy new prints from the Ghastlie series by Alexander Henry! Just in time for Halloween! Nina made this super cute casual dress from an awesome polka dot chambray currently in the store! Perfect for autumn layering! Nina reports that the fabric was dreamy to sew on, and the dress a lot of fun to whip up! 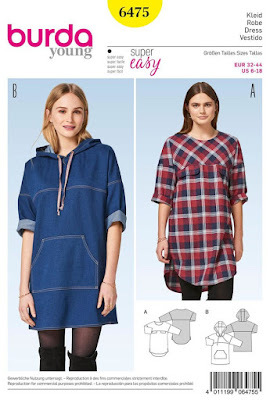 She used Burda 6475, which went together pretty well, but she says the area in the underarm where the side seam, armscye seam, and yoke seams all converge is slightly bulky, so if you make this, be sure to trim your seams. We have lots of gorgeous rayon prints in great autumn colors! Make a cute new blouse or dress to layer with cozy cardigans and jackets! Whip up a simple scarf to accessorize your autumn look! Cool weather is great for cozy, soft cotton flannels, and these cute new flannel prints from Riley Blake should bring a smile to everyone's face! Treadlette Tuesday: Michele and Kenneth King!